Protesters fill Daley Plaza for Saturday’s rally. (Photo by Kevin Beese / Chronicle Media). Mahalea Velasco has been living without her father for six years now. The 11-year-old Chicago girl said her dad was deported as the victim of racial profiling and being stopped by police. Authorities say her father, who entered the country illegally as a teenager, was stopped for an expired license plate sticker and later deported. Velasco said their home, where her mother raises her and her four siblings alone, is filled with loneliness, sadness and tears. She said those same emotions are gripping families being ripped apart by the southern U.S. border as individuals come to this country seeking asylum. “We need to defend babies being separated at the border,” Velasco said. Maggie Rosario of Hammond, Ind. holds up a sign during the Saturday (June 30) protest. Rosario said, “You don’t take kids away from their parents when someone is seeking asylum.” (Photo by Kevin Beese / Chronicle Media). 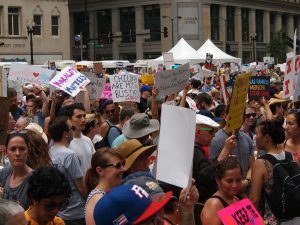 An estimated 50,000 people attended Saturday’s rally and march through Downtown streets spurred after federal agents took children – from infants to teens – away from their immigrant parents. Maggie Rosario drove to Downtown Chicago from Hammond, Ind. to be part of the protest. 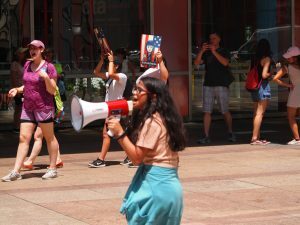 Seated by the Picasso statue in Daley Plaza, Lucy Ascoli waved an American flag as speakers hammered away at the Trump administration’s actions. 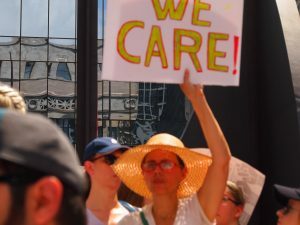 With signs such as “I really do care, don’t you?” and “Keep the families; deport the president,” protesters filled Daley Plaza, spilling out onto nearby Randolph Street. 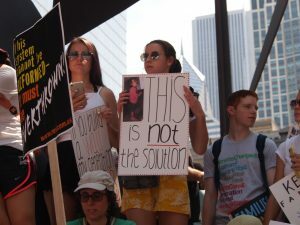 Young protesters hold up signs from the base of the Picasso statue in Chicago’s Daley Plaza, making their feelings known about immigration issues during the Saturday (June 30) “Families Belong Together” rally. (Photo by Kevin Beese / Chronicle Media). The Rev. Michael Phleger, an activist from St. Sabina Parish on Chicago’s South Side, took a swipe at the president during his time at the mic. He balked at members of the Trump administration using Bible passages to try to justify their actions. “You can’t hijack the Scriptures to make your point,” the Chicago priest said. The Rev. 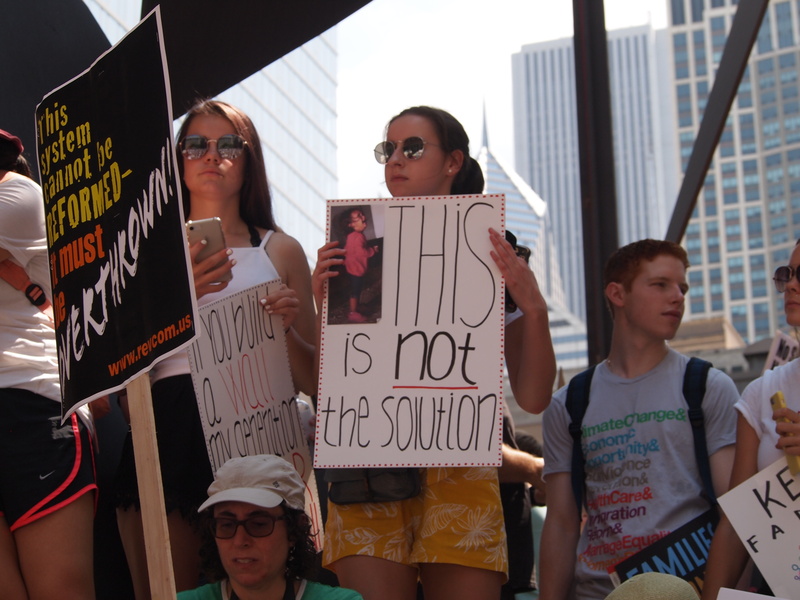 Myron McCoy, pastor of First United Methodist Church at Chicago Temple, agreed, saying that Scripture cannot be used to justify inhumane actions. “We will not turn a deaf ear to any holy book being used to justify and acknowledge misery to our fellow man,” McCoy said. The pastor said that from the bringing of blacks to America in the chains of slavery to the internment of Japanese-Americans during World II, America has a sad history in its treatment of people of color. “We believe it to be our moral responsibility to speak and stand up against evil. We dare not let any man or people cause the harming or abuse of children,” McCoy said. Mahalea Velasco, 11, of Chicago, participates in an impromptu rally in front of the State of Illinois Building on Saturday after the main Daley Plaza rally had finished. Velasco’s father was deported six years ago. (Photo by Kevin Beese / Chronicle Media). Immigration attorney Virginia Martinez has heard firsthand the horror stories of people trying to flee Mexico and seek asylum in the United States. “The stories I have heard give my nightmares,” Martinez said. She said one woman told her about being raped twice in front of her 9-year-old son as she tried to make her way north from Mexico. Martinez said for youths to be separated from their parents upon entering this country is an awful policy. “Children should not be separated from their parents by the government,” Martinez said. Martinez said to put fathers in a different ICE facility from their children is just plain wrong.